New Guardians Of The Galaxy Vol. 2 Concept Art Released! First Look At Mantis! Marvel Studios has released (via EW) a new piece of concept art, illustrated by Andy Park, for Guardians of the Galaxy Vol. 2. 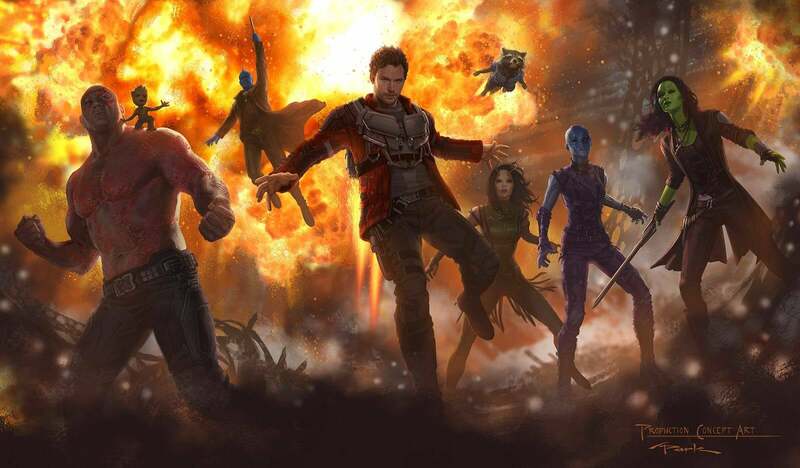 It features (from left to right): Drax striking a powerful pose, a baby-sized Groot perched on the Destroyer's shoulder, Yondu in mid-air clutching his Yaka Arrow, Star-Lord front-and-center wearing some sort of jetpack, Rocket soaring in the air with an explosion coming from behind him, Mantis revealing herself for the first time, Nebula striking a mechanical pose, and Gamora with her sword drawn. As mentioned above, this is our first look at Mantis, who is being played by French actress, Pom Klementieff (Spike Lee’s Oldboy). Like her comic book counterpart, Mantis has a pair of antennae, but unlike her comic book counterpart, she doesn't have green skin. In the comics, Mantis is a half-Vietnamese, half-German hero with psychic powers, martial arts skills, and ties to the Kree empire. She’s the daughter of the morally ambiguous character Libra and has been a member of both the Guardians and the Avengers. Make sure to right click on the image directly below and select "view image" to see it in all of its high-resolution glory.